19th March 2018, New Delhi: India has a thriving middle class and a middle-class consumer buys a product based on its utility, its life span and most importantly, its after-sales customer service. 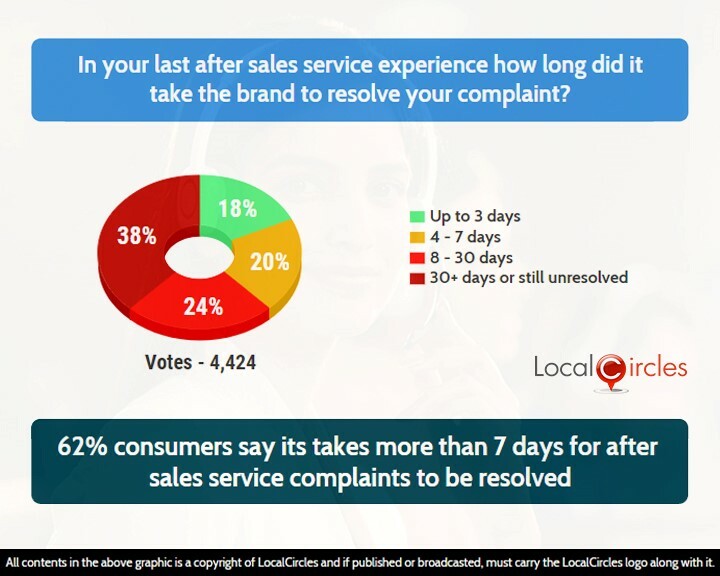 Many cases of bad customer service have been reported by consumers on LocalCircles continuously. 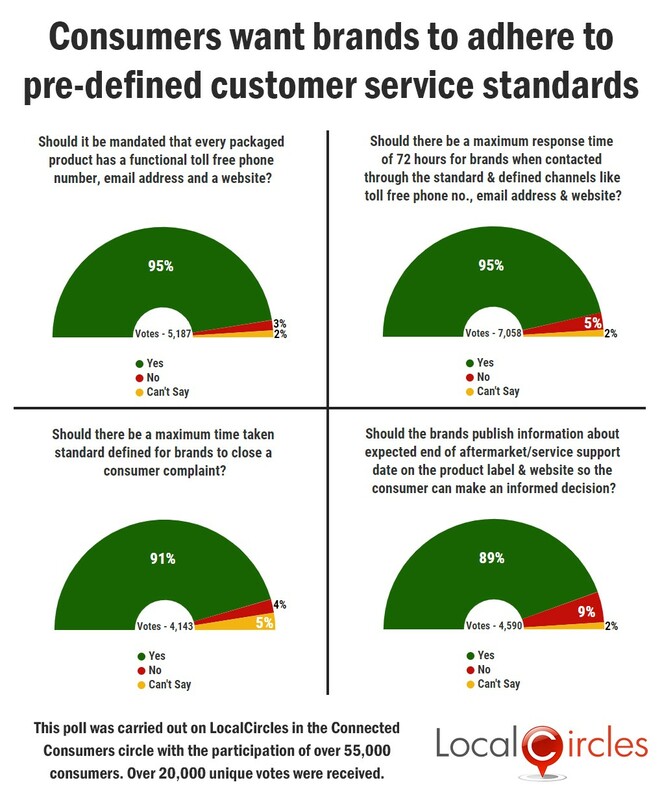 In the absence of set customer service standards in the country, LocalCircles conducted a set of polls to ascertain the consumer pulse on the issue. With more than 38,000 votes coming in, the result of the poll show that majority of the consumers are on the same page when it comes to the effectiveness of brand customer service in the country. 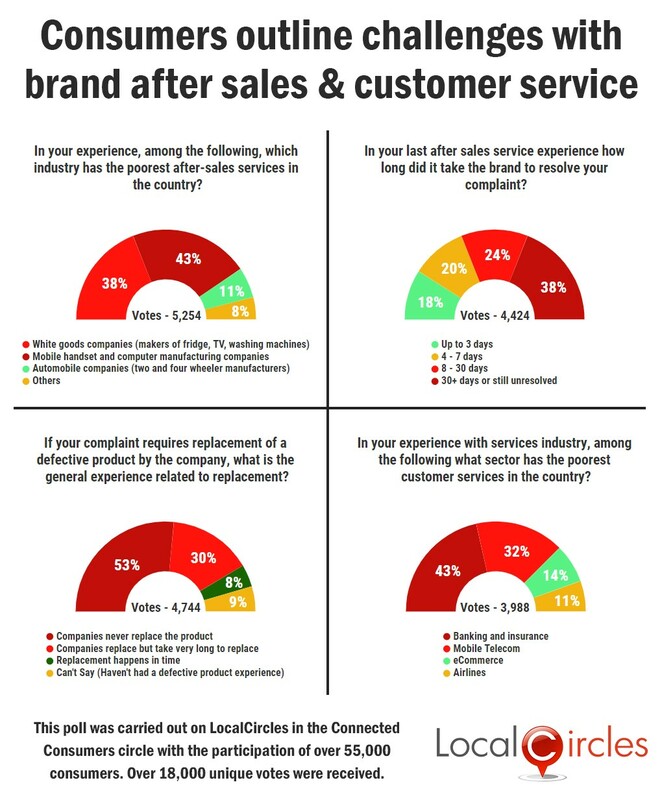 The first question asked consumers in their last after sales service experience how long it took the brand to resolve their complaint. 18% said it took up to 3 days, 20% said it took 4 - 7 days, 24% said it took 8 - 30 days and 38% said it took 30+ days or is still unresolved. 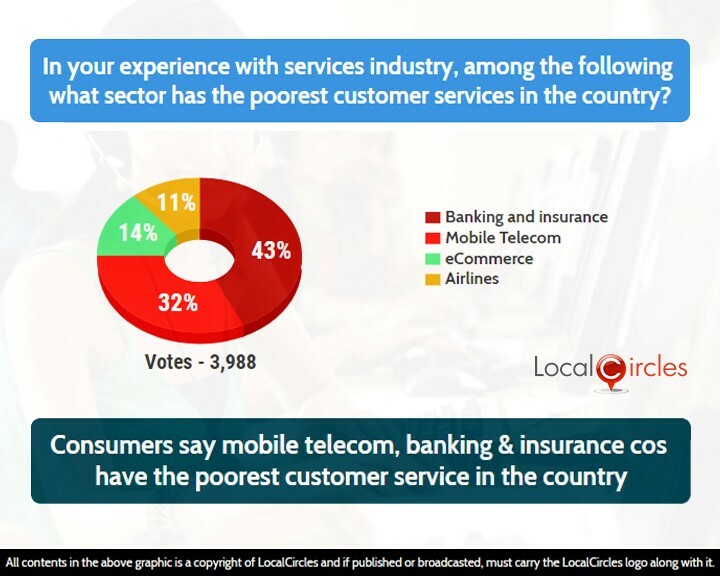 Second question asked consumers which industry has the poorest after-sales services in the country in their experience. 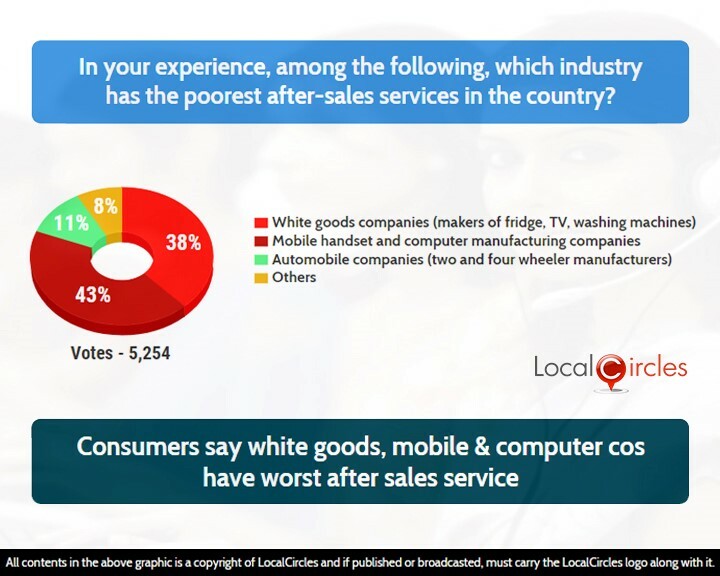 38% said white goods companies (makers of fridge, TV, washing machines etc. ), 43% said mobile handset and computer manufacturing companies while 11% said Automobile companies (two and four-wheeler manufacturers). 8% chose others. 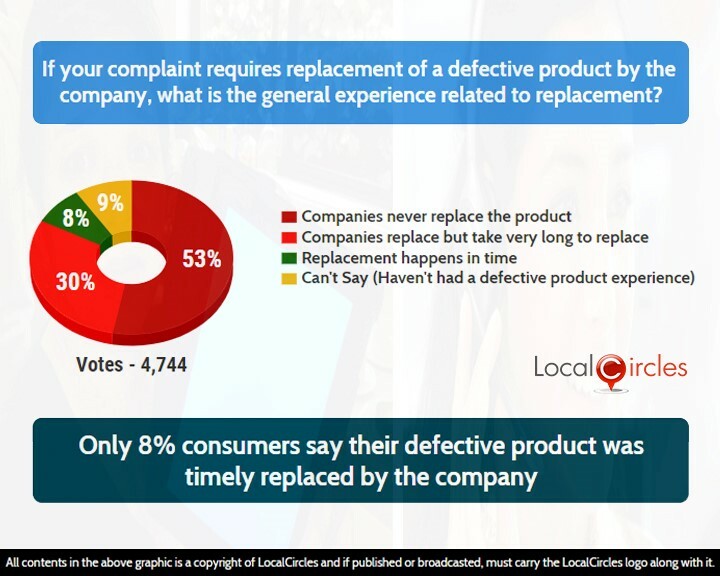 The following question asked consumers if their complaint required replacement of a defective product by the company, what was the general experience related to replacement. 53% said companies never replace the product, 30% said companies replace but take very long to replace, 8% said replacement happens in time and 9% were unsure or did not have such an experience. Next question asked the consumer what sector has the poorest customer services in the country in the service industry. Banking and insurance got 43% votes, Mobile Telecom received 32% votes, eCommerce received 14% and Airlines got 11% votes. In the fifth poll, 93% consumers said that brands should acknowledge complaints within 72 hours when contacted through the standard modes of toll-free number, email or website. 5% consumers voted against it and 2% chose not to answer the question. The sixth poll asked consumers if it should be made mandatory for every packaged consumer product to have a functional toll-free phone number, email address and a website in interest of good customer service. 95% consumers responded in a ’yes’ and only 3% responded in a ’no’. 2% were unsure about it. Many consumers have complained that customer service numbers of many companies do not work and a large number of emails written to them also stay unanswered. 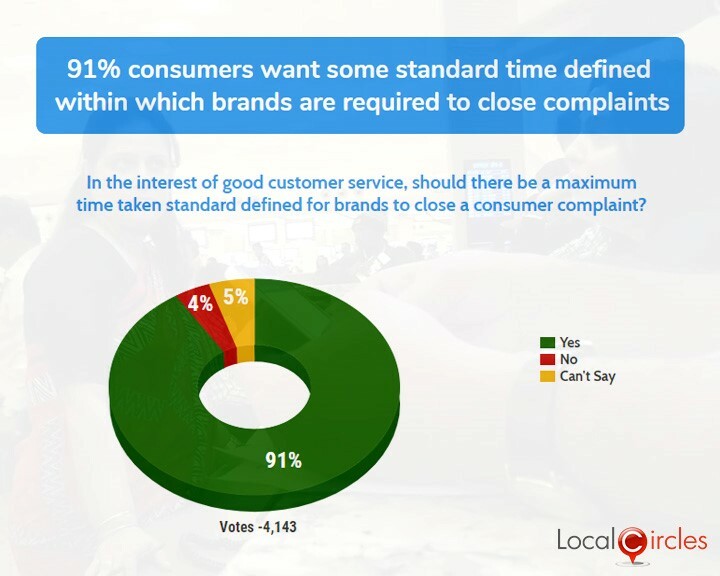 The penultimate poll asked consumers if there should be a ‘maximum time taken’ standard defined for brands to close a consumer complaint. 91% consumers replied in an affirmative while 4% replied in a negative. 5% were unsure. The last question asked if brands should publish information about expected end of aftermarket/service support date on the product label and website so that consumer can make an informed decision. In response, 89% consumers agreed with it while 9% disagreed with it. 2% were unsure. The business world once echoed the same sentiment – ‘customer is always first and always right’. Now, not quite. The focus on customer care as an essential pillar of business seems to have lost its importance or is rather being ignored. Consumer complaints around inadequate and inefficient customer service have become very common. So much so that even the consumer courts are brimming with cases. After-sales customer service has become an important component of the purchase pattern of the modern consumer. 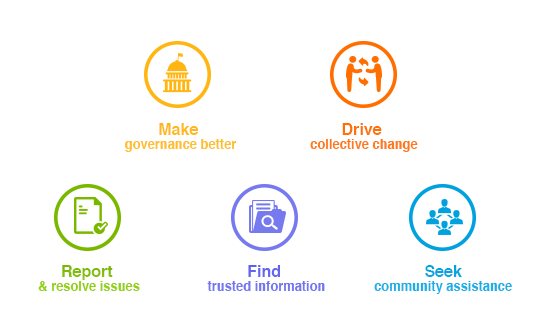 Consumers also suggested different ways of improving customer service by brands. These included having a well-manned customer service helpline, every email enquiry to be properly replied to and tracked, a dedicated person taking care of social media complaints and in case of a change in customer service coordinates, brands promptly informing the customers about it.